We Dive Deep Into the New and Exclusive Master of Atlantis Slot From Blueprint Gaming to See What Treasures May Be Lurking! 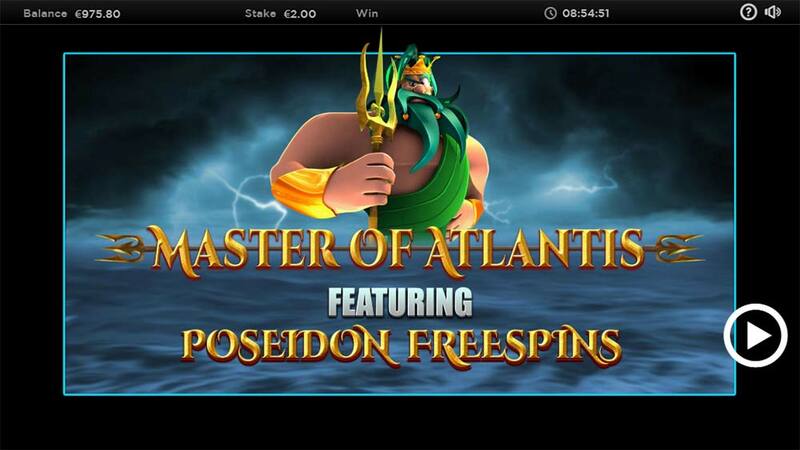 Casumo Casino has just added the new and exclusive Master of Atlantis slot from Blueprint Gaming to their casino, they have a 3 month exclusive on this slot so if you are looking to play it anywhere else you will be waiting until mid- June 2019 to get your grubby mitts on it! 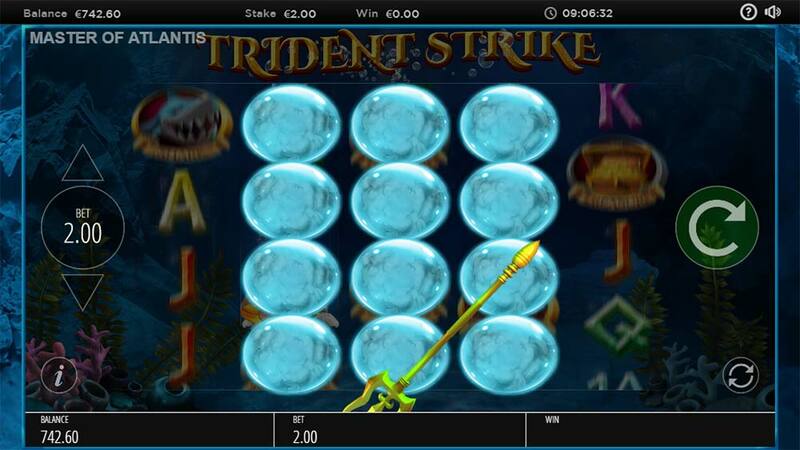 Master of Atlantis has a few subtle differences from the regular Blueprint Slots which are generally 5×3 reel arrays with 20 paylines and come packed with multiple bonus rounds and base game features. 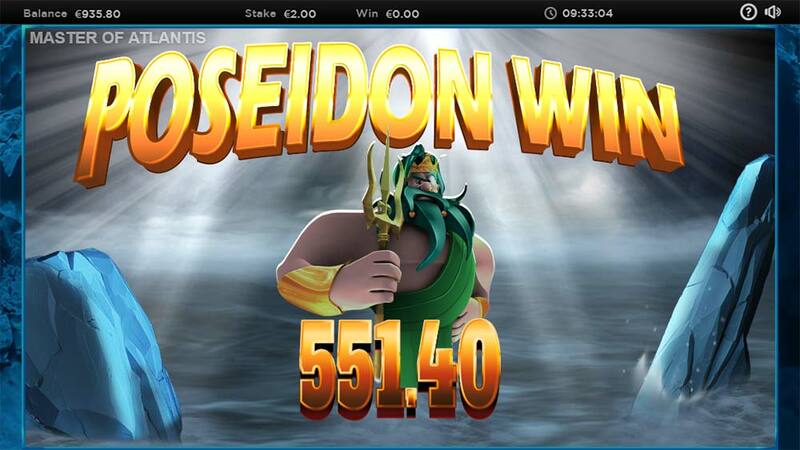 In Master of Atlantis however the reel array has been increased to 5×4 and the paylines increased to 40, there is just 1 random base game feature and 1 special free spins round with a few twists thrown in for good measure. The super-stacked high paying symbols are still on the reel strips so the base gameplay still feels like a blueprint slot, and if you have played any of them before you will know the bonus rounds, in particular, are where all the really juicy stuff is at. The base game Trident Strike was a bit of a let down in our playtests with Poseidon releasing his trident adding a random amount of Mystery symbols to the reels, the trouble is we didn’t see any on reel 1 which meant little or no wins from this feature in our short playtests, underwhelming to say the least. The main bonus round can be much more exciting though, with a regular 3 scatter trigger granting 1 Power Spin and 5 Free Spins, with additional triggering scatters granting extras Power Spins which are really key in getting the bigger wins during the free spins. The main free spins round is triggered by landing 3 or more scatters which grants 1 Power Spin and 5 Free Spins, additional scatters increase the number of power spins up to a maximum of 3. 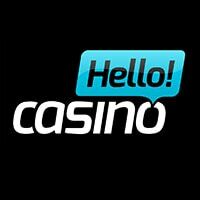 Extra Spins and extra Power Spins can be awarded by landing scatters during the bonus round and these can really help to extend the length of the bonus round and winnings too. 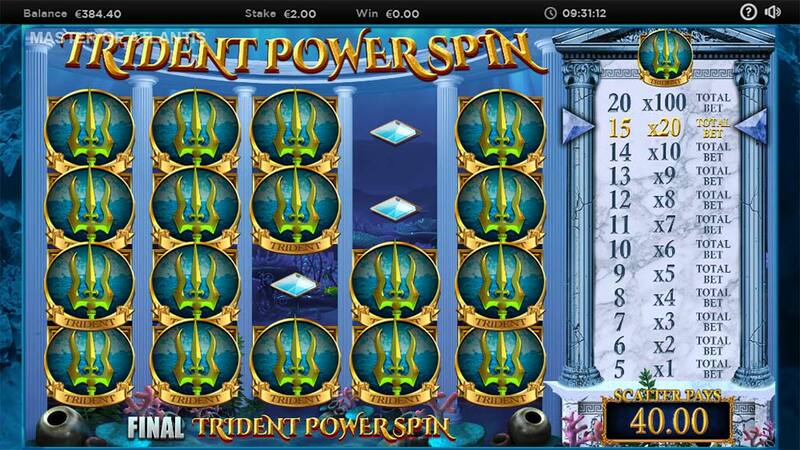 The main bonus round starts off with the Trident Power Spin where only this special symbol and blanks exist on the reels, any of these symbols that land in view is held on the reels for the duration of the bonus round, with a handy table showing (see screenshots above) what these symbols will now be worth during the free spins up to a maximum of 100x stake! Any additional power spins are played out and then the free spins round begins. 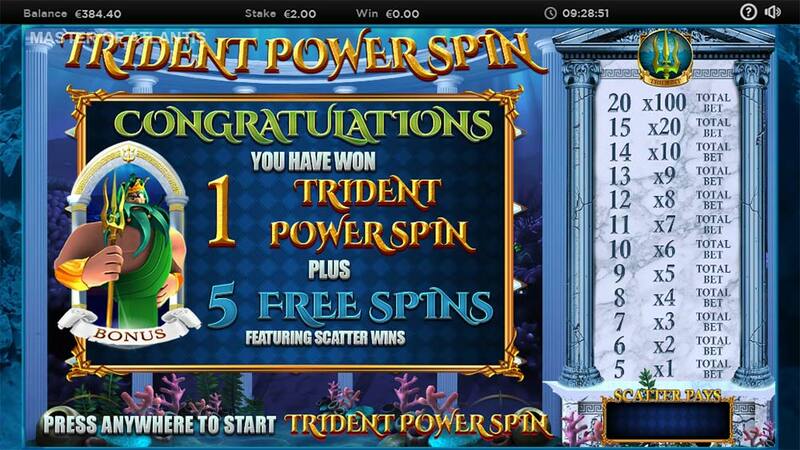 With the 5 free spins not only are you hoping for as many Trident symbols as possible but for additional scatters to land on the reels, where a quick picking round will reward you with extra spins or another power spins giving you further chances of increasing the Trident symbols value. Master of Atlantis is a fairly decent release from Blueprint Gaming with the main bonus round being the standout feature by a big margin, whilst we were a little disappointed by the base gameplay and lack of random features that are normally packed into their slots. If you happen to get a dry spell with no bonus triggers the base gameplay is fairly unforgiving in maintaining your balance, but this slot really does shine when the bonus round begins. 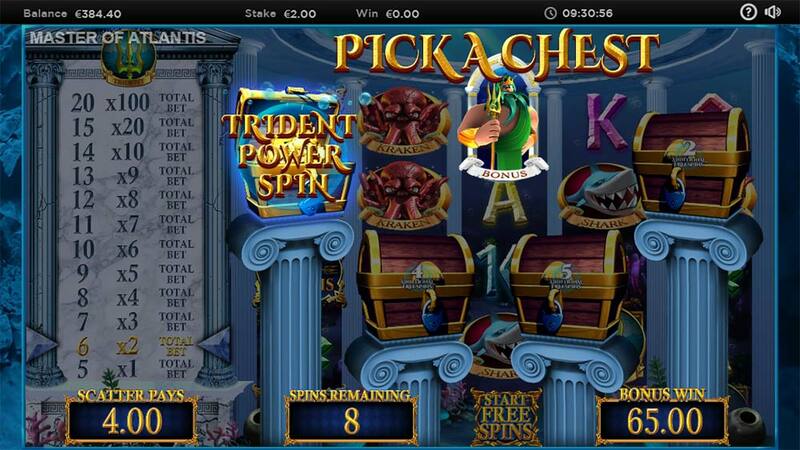 With the additional free spins that can be earned along with extra power spins from the picking round the value of each Trident Symbol can grow quickly, whilst the maximum of 100x bet required 20 symbols it is quite possible to get up to the higher levels on this feature with a few re-spins. In our playtests, we managed to reach up to the 20x stake levels for the Trident which resulted in a bonus round of over 250x stake, which for a short playtests isn’t too bad! Overall the base gameplay is a little lacking but the bonus round is exciting and potentially very rewarding, worth checking out!